Argghhh! The Home Of Two Of Jonah's Military Guys.. - A report from the Provincial Reconstruction Team Front. A report from the Provincial Reconstruction Team Front. 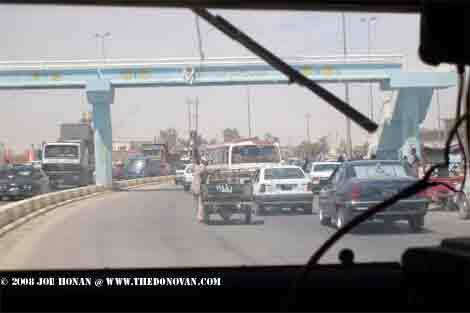 Joe Honan reports in from Embedded Reconstruction Team Ramadi. This is not your Uncle's DoD, as Joe is a surface sailor from JFCOM who's working with the Marines as an agriculture facilitator. It's too bad the Navy doesn't get it about sailors like Joe. Mind you, it's taken the Army long enough to "get it" but they do. What's important about this picture? Joe's caption says what's important: "Route Michigan traffic jam. Last year it was empty except for US soldiers trading shots with Al Qaeda." Emphasis mine. Let's turn it over to Joe. Sorry again for the delay in updating, but it's been a busy couple of weeks for me here. With security in the province getting better, we've been able to really take a long term look at the country around us. That means rather than just responding to crisis (like the emergency sheep feed program I'm working) we are really trying to get a handle on the whole agricultural system, what the needs are to make some quick fixes before the fall planting season and what the long term solutions are. That means I've been out most of the days these past weeks having meetings with various Iraqi officials district councils and farmers trying to get "the lay of the land." Main issues are water and inputs. The place can be self-sustaining, growing the feed for animals and providing pasturage if they can get the water from the river to the fields. That takes power, and with electricity and gas in short supply, it's hard. Then there are the areas that need repair, and add on the inefficient flood irrigation (water flows to the fields in dirt ditched, shovel an opening, flood the field, shovel it closed again) and you've got a lot of acres that can't be cultivated. Add on issues getting inputs like good seed, fertilizer and herbicides and its hard to feed yourself, never mind truck surplus to market. Like anything else here, its all connected, so without seed, irrigated land stays empty, and without gas the tractors don't plow. Add on issues about finance so farmers can get loans, land ownership laws, and foreign policy, its gets confusing pretty quickly. I like asking open ended questions "so...you getting any government subsidies?" and just letting them talk. Of course sometimes that leads to some difficult conversations. Interpreter: "He says that the problem is that the young men think farming is too hard, and they join the army or the police because the money is better." Me: "Uhh...yeah...Tell him that's too bad, but I can't help him there." Guy in the back pointing his finger at me, talking angrily and me hearing the occasional "Ameriki." Lead sheik (actually a young guy) speaks conversationally and then everyone laughs. What happened was the guy in back said that a problem was Turkey cutting the amount of water coming down the Euphrates, because they were building dams. America, which was the greatest power in the world, should go to Turkey and tell them to stop. The Sheik told a story about his grandfather, when the irrigation was mostly rainfall based. It was dry, and a few of his people came and demanded he do something about it. "He replied, who am I God? Only he can make it rain." (Being part Irish I enjoy answering questions with amusing personal anecdotes.) His point was that they have their own government, and they can't rely on the US to do everything. That's an interesting development I've seen, most of the men I've worked with understand that they need to be reconnected to their own government before any real lasting change. They have security, a chance to send their kids to school without fear that they will be killed, and good local government. However this is a socialistic society, and without the help of the ministries in Baghdad they can't do it. They're working on it. I spoke to the local Farmer's Federation about the lack of feed for their sheep (3 year drought) and they wanted to meet the provincial governor to talk about their issues. I told them that I'd see what I could do with the governor, but in the meantime they should gather letters from their farmers describing how they are being affected to present to the governor at the meeting. They said "We want the coalition forces there so they can hear what the governor promises." I said "You want the local paper and radio reporters there so all the voters hear what he promises." You could see the switch click on. There's an election in September, and the power inherent in the electorate only exists if they know, and the politicians know, its there. We really are trying to build an airplane while it's flying. You can't just stop government and vital services like clean water while you assess and repair the purification system. You have to keep going along maintaining basic function, handling emergencies and doing long range solutions at the same time. Also keep in contact with the four or five other US organizations out there doing the same thing. Oh, and keep an eye on the security situation too. Like any military organization, there is an underground group here called the "Morale Suppression Team" working against any fun here. (Think of the Illuminati as run by the Grinch). Anyway I had a run in with them last week. MST: Hey you want to go on R&R? Four days in Qatar? You're not excited? You can have a few beers and relax at the pool. We'll send you early, you can go with Peeto and Izzy, and they're fun guys. Oh wow, this should be great! Ooooh...sorry weather's bad. No flights out. You can't crush anyone's spirit unless its been raised to begin with. The link above is a .pdf of the pics Joe sent along with the update. Joe notes: This shot shows the kids 2 seconds after they realize I don't have any candy - but the Marines on the other side of the HMMWV do...!" Joe wrote: They said “We want the coalition forces there so they can hear what the governor promises.” I said “You want the local paper and radio reporters there so all the voters hear what he promises.” You could see the switch click on. EXCELLENT!!! Now that's the kind of story we should be hearing more of, as often and as loud and from as many different sources as possible. Shows that the Iraqis GET IT about being a real democracy. Yep. Bring in the media and twist some politician's tails. That's if they aren't too afraid to tick off the local power base. Wow, BillT! Reporters reporting bare facts and not inserting their opinions? Why can't WE have reporters who do that here in America! Reporters reporting instead of campaigning for the defeatist agenda. That could make a good GEICO commercial. People would never stop laughing. It's nice to see Ramadi change. I operated there with a Marine ANGLICO team from 08/05 to 03/06 and again from 08/06 to 03/07. 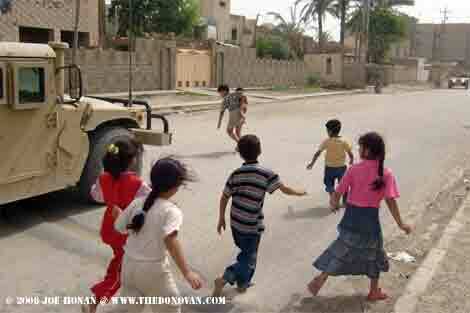 You did not walk down Rte Michigan and if you drove you'd get hit by an IED. Contact, contact and more contact....nice to see some peace. That is awesome news, I was in ramadi May 06 to Feb 07, I can't believe the change! Stay safe and keep the stories coming. You've been Instalanched and I'm damned glad to see it. Americans DESPERATELY NEED to hear this kind of story and hell will freeze over before anyone in the MSM will tell it (with the possible exception of Fox News). Nice work! Oh, BTW, next time have some candy! Local politicians that understand relating to voters is important? Maybe, someday, here in America we can get that too... Thanks for the report! Have to check and see how the factory situation in Ramadi is. If I can find a report on it... maybe, someday, here in America we can get reporters to tell us about such things. Thanks for sharing! Looking forward to more reports. The "emphasis mine" text referred to on the home page isn't, but it is emphasized (italic) on the linked page. Safari 3.1.1, MacOS X 10.5.3, just in case it's a browser glitch. OK, now the emphasis added on the front page works correctly.